At 0140 hours, a second F-4 was scrambled, piloted by Lieutenant Parviz Jafari and Lieutenant Jalal Damirian. Jafari would eventually retire as a general and participate on 12 November 2007, at a National Press Club conference demanding a worldwide investigation into UFO phenomena. Jafari's jet had acquired a radar lock on the object at 27 nautical miles (50 km) range. The radar signature of the UFO resembled that of a Boeing 707 aircraft. Closing on the object at 150 nautical miles (280 km) per hour and at a range of 25 nautical miles (46 km), the object began to move, keeping a steady distance of 25 nautical miles (46 km) from the F-4. The size of the object was difficult to determine due to its intense brilliance. The lights of the object were alternating blue, green, red, and orange, and were arranged in a square pattern. The lights flashed in sequence, but the flashing was so rapid that they all could be seen at once. Once again, as soon as the F-4 had turned away, instrumentation and communications were regained. The F-4 crew then saw another brightly lit object detach itself from the other side of the primary object and drop straight down at high speed. The F-4 crew expected it to impact the ground and explode, but it came to rest gently. The F-4 crew then overflew the site at a decreased altitude and marked the position of the light's touchdown. Jafari would later comment that the object was so bright that it lit up the ground and he could see rocks around it. The object had touched down near Rey Oil Refinery on the outskirts of Iran. Then they landed at Mehrabad, noting that each time they passed through a magnetic bearing of 150 degrees from Mehrabad, they experienced interference and communications failure. The next day, the F-4 crew flew out in a helicopter to the site where they had seen the smaller object land. In the daylight, it was determined to be a dry lake bed, but no traces could be seen. They then circled the area to the west and picked up a noticeable "beeper" signal. The signal was loudest near a small house, so they landed and questioned the occupants of the house about any unusual events of the previous night. They reported a loud noise and a bright light like lightning. f) An inordinate amount of maneuverability was displayed by the UFOs." In 1994, the Sightings TV program tracked down and interviewed various principals involved in the incident. Nearly all expressed the opinion that they were dealing with a high-technology extraterrestrial craft. The pilot of the first jet interceptor, Yaddi Nazeri (above in the article, the first pilot is stated as 'Captain Mohammad Reza Azizkhani'), estimated that the UFO was traveling somewhere between two and three thousand miles per hour. He said that the object "...was beyond my speed and power. The [later] F-4... also could not catch up to the object. That's when I thought, this is a UFO." Nazeri added that "...no country had this type of flying object, so I was thinking, this craft is from another planet." General Nader Yousefi, the assistant deputy commander of the Iranian Air Force, said he ordered the two jet interceptions. He said that, "Because of the experience I had on 19 September 1976, I believe there is something up there. We just don't know what it is or where it came from." Tower controller Pirouzi was also among those interviewed. He recalled a discussion by Azarbarzin's panel at the conclusion of the meeting. "When they heard our report and the report of the pilots, they concluded that no country is capable of such technology, and all of them believed it was a strange object from outer space." When interviewed by Sightings, Azarbarzin independently confirmed Pirouzi's statement. He said they concluded that the UFO had deliberately jammed both the aircraft and control tower electronics. About the objects that seemed to shoot out of the UFO, Azarbarzin said, "The pilots called them fireballs, but we all thought that they were very powerful waves of electromagnetism, which jammed all the electronics starting from VHF, UHF, fire control system, gun radar, gun communications, everything. Everything was gone." This conclusion was relayed to General Hatemi, the Shah's personal military advisory, who instructed Azarbarzin to give his report to the U.S. Military Assistance Advisory Group in Tehran (MAAG). In charge of MAAG and chief U.S. Air Force military advisory to the Iranians was General Richard Secord. Secord declined to be interviewed. Gen. Azarbarzin refused to state publicly whether Secord had seen the report, but another high Iranian Air Force commander, Mamoud Sabahat, told Sightings that he was present in Tehran to attend a meeting on the night of the incident. 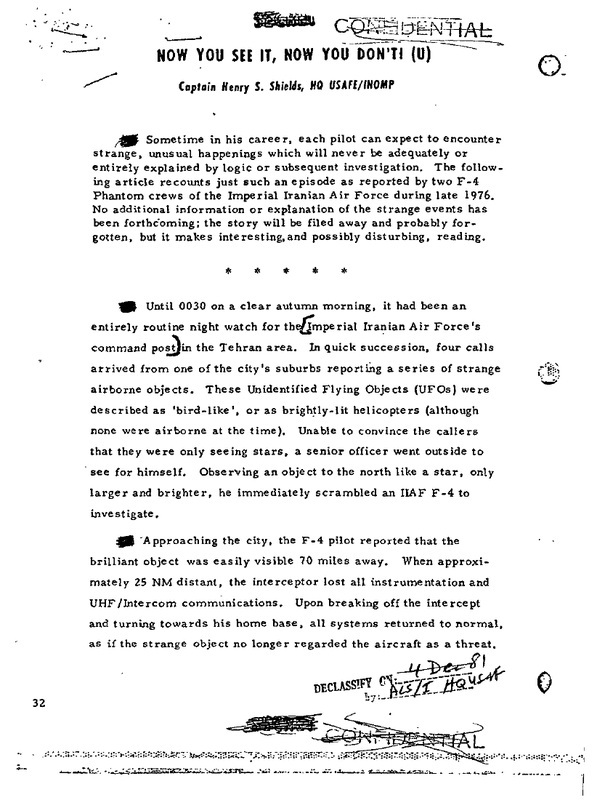 "This UFO event was the first time in our Air Force's history that anything had happened like this. It would have been a usual and customary part of the military system to put him [Secord] at that meeting." About his personal opinion, Gen. Azarbarzin told Sightings, "I believe in UFOs. I cannot ignore their existence. They want to find some way of contacting the people of earth. They are trying, and they are going to do it." Azarbarzin's opinion was echoed by Amir Kamyabipour, former deputy commander of operations in the Iranian Air Force. Because of what he experienced first-hand during this incident, he believes, "UFOs are trying to find some way to make contact with our world. I am positive of this." In the 1 October 1976 issue of the Iran Times from Washington, D.C., an apparent firsthand account from Lt. Jafari, the pilot of the second jet interceptor, was published, based on a tape of the actual pursuit. The aircraft flew towards Tehran at over the speed of sound. Jafari said that on seeing him coming, the UFO increased its speed. 'It was half the size of the moon as seen from earth,' he said. 'It was radiating violet, orange, and white light about three times as strong as moonlight.'" Jafari was ordered to return to base if he was unable to get near, and Jafari cut off pursuit. As he was returning, he "told air controllers that the UFO had doubled back on its pursuers, and he was in danger of being forced down. 'Something is coming at me from behind. ...I think it is going to crash into me. It has just passed by, missing me narrowly...' The disturbed voice of the pilot was clear on the tape." 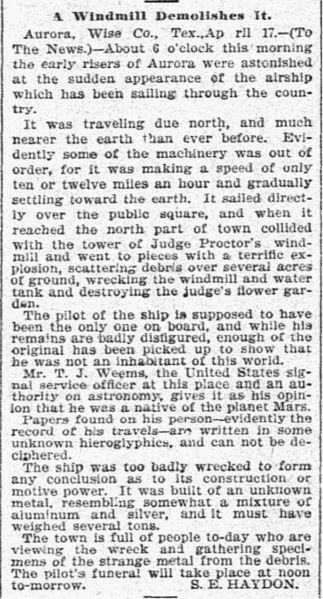 The article also recounted how the pilot spoke of a "bright round object, with a circumference of about 4.5 meters, leave the UFO." It also said that the authenticity of the object had already been confirmed by the two F-4 pilots, several control tower operators, and witnesses on the ground who reported a "bright body" flit across the sky while others reported seeing "some bright thing" fall from the sky. Another document later came to light revealing that a very similar UFO was sighted in Morocco from many locations about 3 to 4 hours later, or 0100 to 0200 hours local time on 19 September. The document was from the American embassy in Rabat, Morocco to the U.S. State Department, dated 25 September 1976--"Subject: Request for Info. Unidentified Flying Objects." It recounted that the Moroccan police had received numerous reports of an object generally flying parallel to the Atlantic coast at low altitude. It had a silvery luminous circular or tubular shape and was giving off intermittent trails of bright sparks and fragments. It made no noise. One of the embassy's unnamed briefers said he had seen it himself, and that it appeared to be traveling slowly like an aircraft preparing to land. At first it appeared disc-shaped, but took on a tubular appearance as it got closer. Secretary of State Henry Kissinger responded ten days later and took the official U.S. policy line on UFOs. Kissinger claimed the Condon Committee report had shown that all UFOs could be attributed to natural causes and no further study was warranted. Kissinger said people had probably seen a meteor or a decaying satellite part for which there was no re-entry record. In 2012, amateur satellite observers identified the cause of the Moroccan sightings as the re-entry of the "BOZ ullage motor assembly ejected from the third stage of the Molniya rocket that orbited Molniya 1-35". They produced a ground track plot that shows that the re-entry trajectory passed within sight of all locations from which UFO sightings were reported. "Sometime in his career, each pilot can expect to encounter strange, unusual happenings which will never be adequately or entirely explained by logic or subsequent investigation. The following article recounts just such an episode as reported by two F-4 Phantom crews of the Imperial Iranian Air Force during late 1976. No additional information or explanation of the strange events has been forthcoming: the story will be filed away and probably forgotten, but it makes interesting, and possibly disturbing, reading." In his book UFOs: The Public Deceived, journalist Philip J. Klass claimed the witnesses initially saw an astronomical body, probably Jupiter, and pilot incompetence and equipment malfunction accounted for the rest. Jerome Clark commented, "Klass's theory presumes a remarkable lack of even rudimentary observing and technical skills on the parts of the Iranian participants. In some ways it would be easier to credit the notion, for which no evidence exists either, that the witnesses consciously fabricated the sighting. Both Gen. Azarbarzin and air controller Perouzi considered the incident thoroughly puzzling. So, as the documents indicate, did American analysts familiar with it." 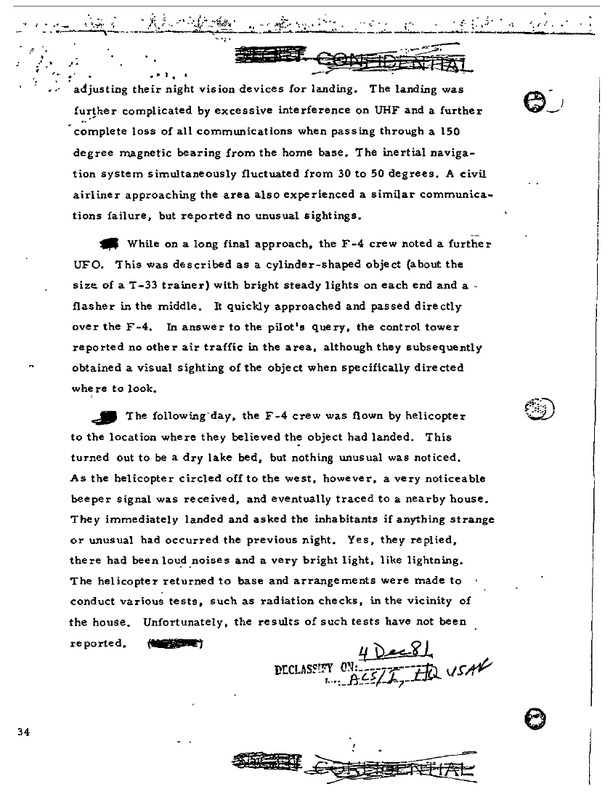 The incident is regarded by a number of UFO researchers to be one of the premier UFO encounters ever recorded. Some researchers consider it strong evidence for the extraterrestrial origins of the UFO because there was a blackout on the F-4 just when it was going to fire and because of instrumental breakdowns on two different aircraft while they were on the chase. A military spy satellite also recorded this incident. The DSP-1 satellite detected an infrared anomaly during the time of this event that lasted for about an hour. At a press conference at the National Press Club in Washington D.C. on 12 November 2007, the pilot of the second F-4, General Parviz Jafari, recounted how he tried to intercept an "object which was flashing with intense red, green, orange and blue light." Jafari said that, "Four other objects with different shapes separated from the main one, at different times during this close encounter. Whenever they were close to me, my weapons were jammed and my radio communications were garbled. One of the objects headed toward me. I thought it was a missile. I tried to launch a heat seeking missile to it, but my missile panel went out. Another followed me when I was descending on the way back. One of the separated objects landed in an open area radiating a high bright light, in which the sands on the ground were visible. We could hear emergency squash all the way, which was reported by other airliners flying at the time and continued for another couple of days. During my interview at H.Q, after the incident, an American colonel took notes..." When asked if he thought this was an alien spacecraft, he said he was quite sure that it was. A somewhat similar UFO incident over Tehran occurred in 1978, again involving electromagnetic interference and U.S. DIA interest. The report was sent by the U.S. Defense Attache's office to the Joint Chiefs of Staff, part of the normal routing for foreign intelligence reports. As in the 1976 case, the distribution list included the Secretary of State, the NSA, and the CIA. The report was quoted from the Iranian English-language newspaper Tehran Journal, dated 18 July 1978. The article said that a UFO had been seen by a number of people on the night of 16 July, again in the northern part of Tehran. One witness said he saw the object suddenly emerge in the sky and hover directly above him. Witnesses said it was a "strange glowing object" that seemed to be floating southwestward toward Saveh (about halfway between Tehran and Hamadan). Witnesses contacted the National Radio Network and the control tower at Mehrabad, which confirmed the existence of the object but provided no further details. The article added, "Officials from the control tower at Mehrabad Airport and a Lufthansa aircrew also reported unusual readings on their instruments." 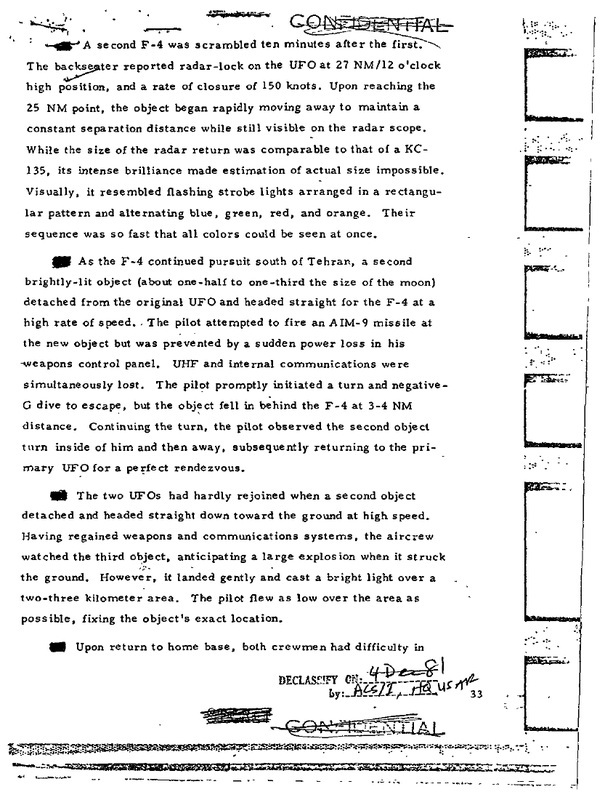 The article also briefly mentioned another recent UFO incident from April 1978. A local pilot said that he and his copilot had photographed a "glittering" object while flying between Ahvaz and Tehran. (Ahvaz is about 750 miles (1,210 km) southwest of Tehran.) He could not release the photographs until the security division of the civil aviation authorities gave permission. Apparently there was also ground radar corroboration. "A Mehrabad radar control official said that on that occasion they had detected an object some 20 times the size of a jumbo jet on their screens." Civil aviation authorities were said to be investigating, but the results had not been made public.